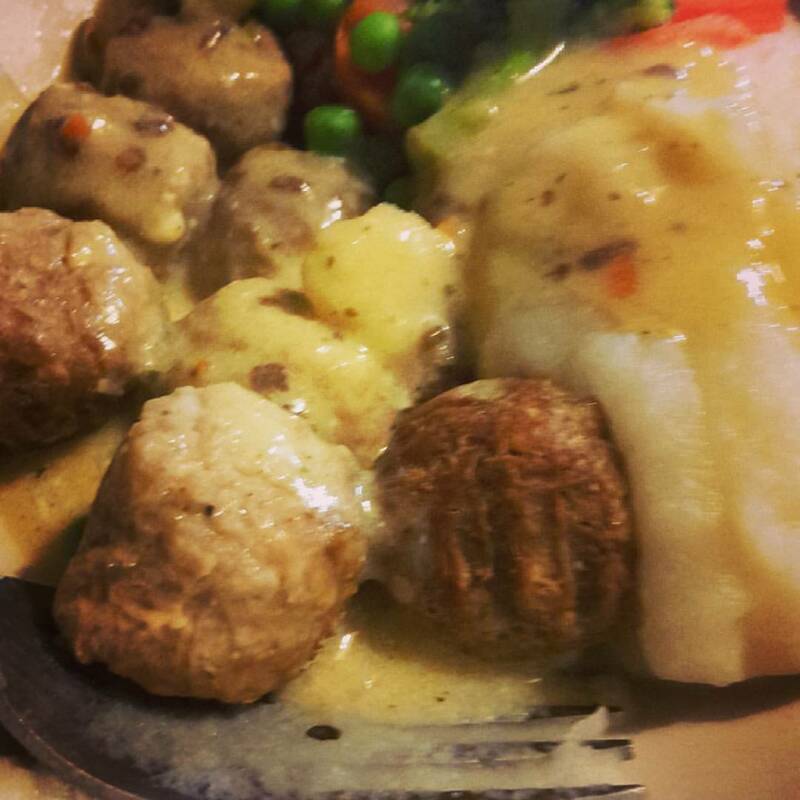 Ah, so who doesn’t use a trip to IKEA as an excuse to eat Swedish Meatballs? Just us, then? We love the Swedish meatballs, and we love that now you can even buy frozen meatballs and sauce packets to take home with you. I always buy 2 bags of frozen meatballs and at least a half dozen packets of sauce mix to keep us going between visits….but eventually, we run out. And as we haven’t had time or a need to go to IKEA in about a year, I needed to get creative. 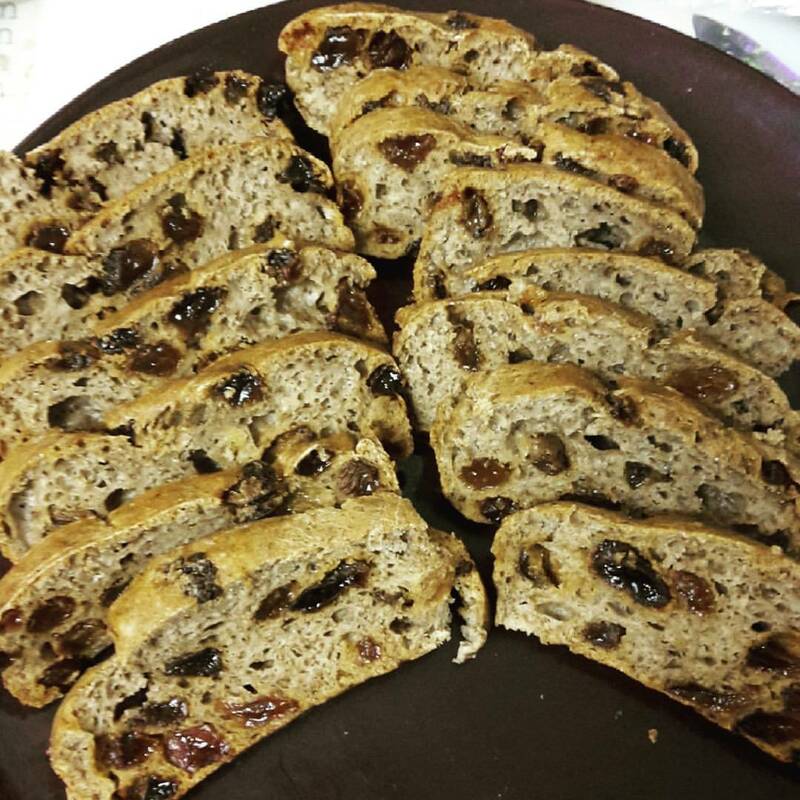 I found this recipe on a facebook group page for Slimming World, so this recipe also is Slimming World friendly. The sauce itself is free, and the meatballs can also be syn free depending on what you use. I know, I know, the recipe sounds a little vague. But really, hear me out. 1. Cook meatballs as directed on their packaging or per your recipe. This time around I used Quorn Swedish style meatballs, but you can use the Slimming World meatballs (FREE) or any other type of meatball. Even make your own from mince if you prefer. 2. Add stock cubes and water to a sauce pan and bring to a boil until the cubes are dissolved. Continue to boil the stock for an additional 10 minutes. 3. Remove concentrated stock from heat and allow to cool for a few minutes before stirring in 3-4 TBS of Fromage Frais. This should make your sauce creamy and a little thick. If it’s not thick enough, add more Fromage Frais. I served ours with Smash and some frozen mixed vegetables. While it’s not exactly the same as what you will get at IKEA, it’s still pretty tasty as a mock Swedish meatball sauce. I’m sure any Swedish friends reading this are shaking their heads in horror now…. Please note: While I used to work for IKEA (in 1998 and then again in 2006), I do not currently work for IKEA and they have not compensated me for writing this blog post. Nor have any of the brands mentioned in this post. 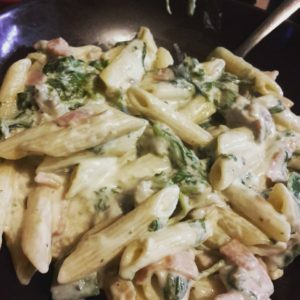 [Slimming World] Let’s go Camping! This post is here because I posted this on my local Slimming World group, and one of the members asked if they could share it elsewhere. Since you can’t share posts made on closed groups, I’m sticking it here. So there aren’t any pics to go with it (yet), but I might edit it tomorrow when I get more time. Tips for staying on Slimming World while camping! Tip 1 – If you are going to be without electricity to keep food cold, a day or two before you go cook up a batch of something like pasta sauce and then freeze it in either a plastic container or in a zipper top bag (double bag it!) and use this as a cold pack in your cooler. After it thaws out, you can cook some pasta and heat up the sauce, but it will keep your food cool for a bit longer. Tip 2 – UHT milk cartons. For Tim and I, we go through 1 500ml carton of semi-skim UHT milk per day of our camping trip, so it’s not left out for very long, but this way you can have milk for coffee, tea, and cereal. You also can freeze them and use them as ice packs in your cooler. 1 – you can make up your own instant porridge packs in plastic baggies. 2 tsp of dried powdered skim milk is 1 Syn. Measure out 35g of porridge and 2tsp of dried skim milk into your bags and in the mornings pour into a bowl and add boiling water. You can add some frozen berries (use them as an ice pack as they thaw!) for some added S foods. 2 – Make hash browns/fried potatoes. Get a tin of new potatoes (it’s only around 20p! ), slice them or cut them into chunks, and fry with some fry light. Super easy, and they go great with some fried eggs, tinned tomatoes, and baked beans. 3 – cold cereal with UHT milk in a pinch.4 – French toast. Dip wholemeal bread into a mixture of UHT milk and an egg and fry with fry light. You can make these sweet or savory by either sprinkling with cinnamon and sweetener and serving with thawing berries, or savory and serve it with fried eggs or scrambled eggs. Tip 2 – Find a metal colander that fits inside your large pot when you make pasta so you just have to lift out the colander when the pasta is done and dump the water instead of finding a place to pour the pasta pot into the colander. 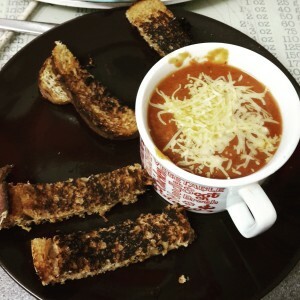 Meal 1 – Vegetable Soup: This is super easy. All you need is a tin of mixed vegetables, a tin of tomatoes, 2 vegetable stock pots, and a handful of pearl barley (optional, but bulks it up). Pour the tins into a pot, add the stock pots, add the barley, and top up with water. The barley takes about 20 minutes to cook (although the longer you leave it, the softer the barley). A larger family might need 2 tins of each and 4 stock pots. You also could open a bag of boil in bag rice and toss it in instead of pearl barley. Meal 2 – Poor Man’s Ramen: 1 Egg noodle nest or block per person, soy sauce, an OXO veg cube per person, tinned peas, carrots, and tinned corn. Toss it all in a pot, crumble the OXO cube on top, and bring to a boil. Takes about 10 minutes. You can drain it OR have it soupy and use soy sauce to taste. Meal 3 – Stir Fry: serve with either boil in bag rice or egg noodles. Meal 5 – if you have leftover sauce, dump a tin of kidney beans and some chili powder to make chilli and serve over rice. Meal 6 – Pasta N Sauce with some added tinned vegetables, or make poor man’s mac n cheese with pasta and tinned veg and while the pasta is still hot, stir in laughing cow wedges. 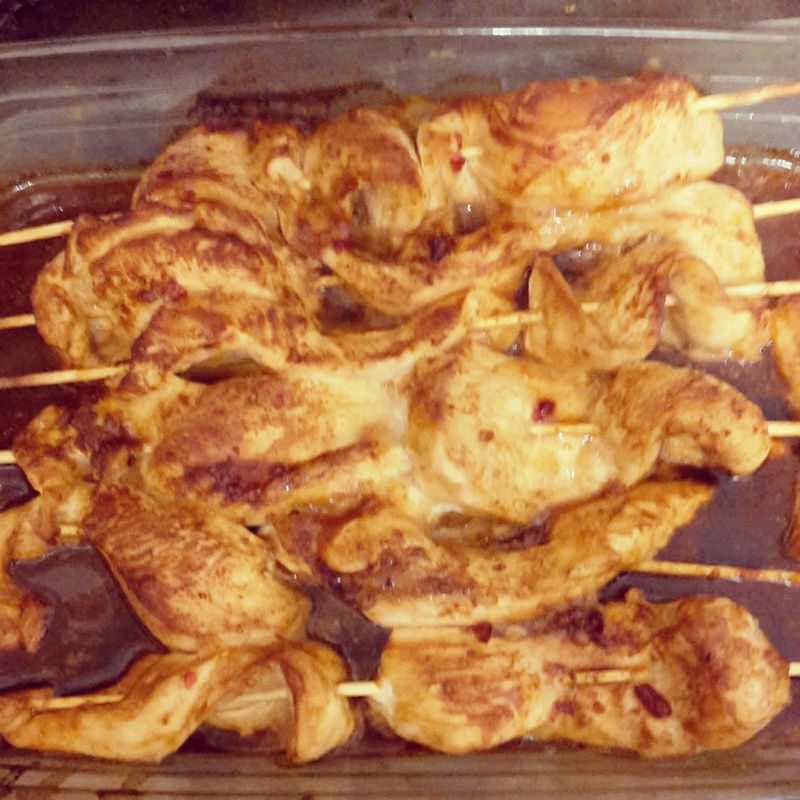 Make it cajun style with some cajun or jamaican jerk seasonings and you could add quorn chicken pieces. We like this especially with the laughing cow blue cheese. Another good grill option for camping is veggie skewers with rice. That’s all I have for now, if I think of more I’ll add it! 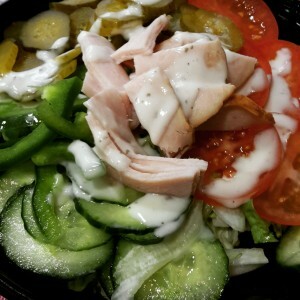 Ok, so this is a Subway salad. 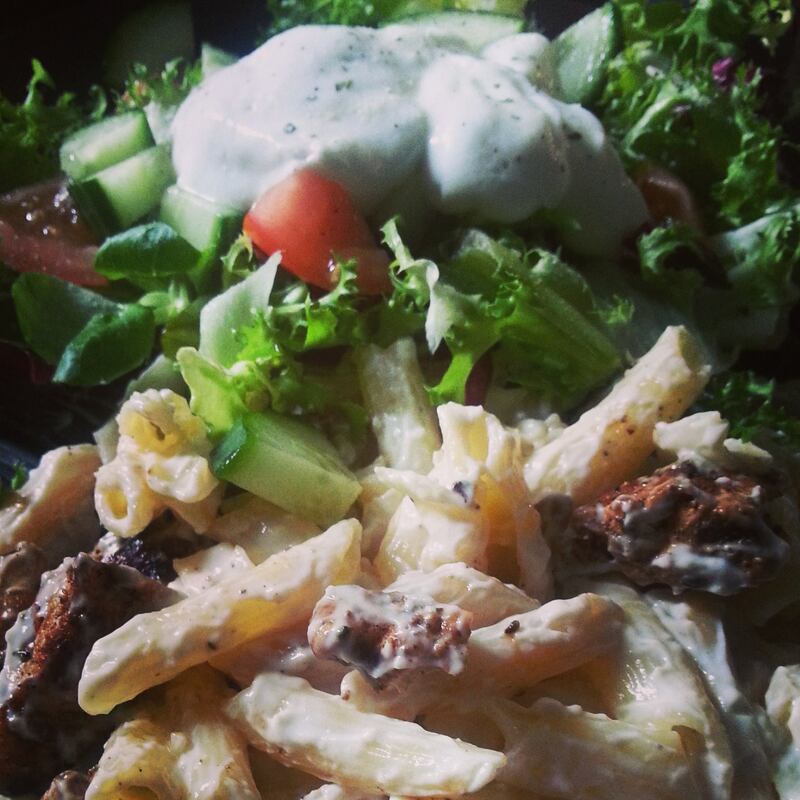 You’ve seen them before, and if you follow Slimming World, you probably eat this a lot when you’re out and about. You know the deal. Lots of Speed, a little bit of P foods, and around 2 syns for some Ranch dressing. But. When I was in town today I very nearly strayed and went to Burger King. So, let me back up bit. The other day, a friend messaged me to tell me she had joined Slimming World, and she wanted to know if I had any tips for her. I drew a blank. How can I offer tips to someone when I’ve spent a year mostly gaining weight instead of losing? So I gave her a generic “stick to the plans”…..and I thought oh, you dummy. How about YOU follow the plans? So back to today. I’m in town. I need Lunch. Options are – fast food or a sit down restaurant. Out of the fast foods, we all know Subway is the best option…..but when you can smell the chips……. In Lincoln, the BK is inside the shopping centre off the high street. To get to it, you have to either take the escalator down into New Look and walk out of New Look and over to it, or you have to walk the length of the upper level and then go down to the lower. So I walked into New Look and just looked at the first item in my path. It wasn’t anything in particular that I would wear, but I looked at the size on the shirt. 10. Could I some day fit into a 10 and take that shirt into the dressing room just to see what it looks like? Would eating at BK really help me on my way? I turned around and walked to Subway. Walk into an American diner, and one thing you’ll spot on the menu is French Toast, and about a half dozen (or more!)) ways to have it , including stuffed. 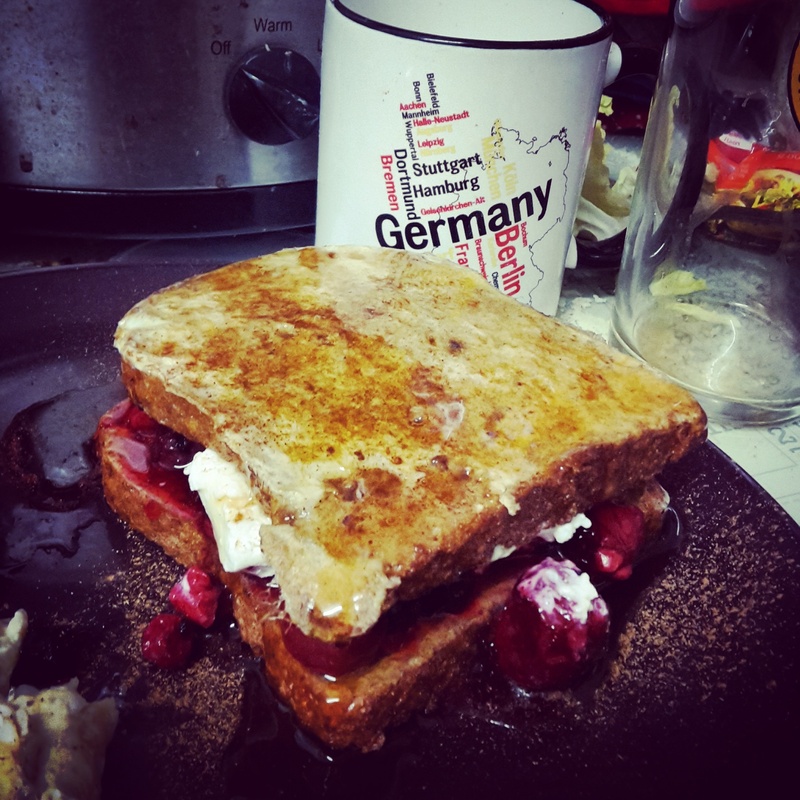 French toast is known as eggy bread in the UK, the only difference being that eggy bread is more of a savory dish, and French toast is usually a sweet. And to further confuse things, in the UK we also have something called fried bread, which you would think would be similar, but nope. Fried bread kind of grosses me out. If you order Stuffed French Toast in a diner, you will usually get two really thick slices of white bread, dipped in a mixture of egg and milk, and fried. Between the two pieces of bread they lay on the sweet cream cheese and then it’s topped with fruit mixed in a sugary syrup. Sounds disgustingly delicious, doesn’t it? Since Tim was swapping over to night shift on Saturday, I knew we would be up late on Friday night (to try to sleep in on Saturday to help him switch over) and Saturday by the time we got up we would be having Brunch instead of Breakfast, and I decided to make French Toast. Then, when I was getting the milk out for my coffee, I spotted the dish of thawed out frozen berries and a container of quark, so I decided to make mine stuffed! Syns: 0, but this will count as your HEB. If you’re not having it as your HEB, you will need to syn the bread. 1. Spray a frying pan with Fry Light and pre-heat it on the hob (that’s stove for my American readers!). 2. Whisk the eggs with the cinnamon in a bowl or dish large enough to fit a slice of bread. 3. Soak one slice of bread in the mixture and fry until golden brown (3-4 minutes per side). Repeat with the second slice of bread (you might need to give the pan another spray of Fry Light too). If your frying pan is large enough, you could do both slices at once. 4. Spread one slice of French toast with quark, top with mixed berries, and place the second slice of French toast on top. Not only is this a great Slimming World brunch choice, it’s great for a diabetic! If you wanted to make a “full fat” version, use cream cheese instead of quark and you could use tinned fruit in syrup. 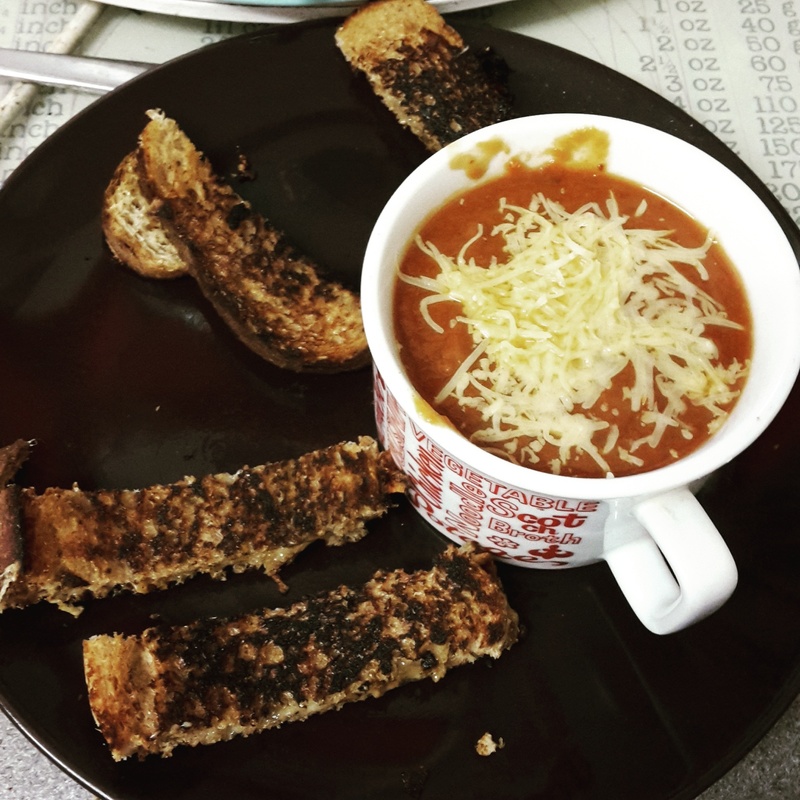 I regularly make Slimming World speed soup because it’s super easy, and the ingredients are almost always in my cupboard and if they’re not, the local co-op stocks everything I need. I’ve been on a Crock Pot (Slow Cooker) kick lately, especially with it becoming colder outside and Tim wanting to take food in a hot food flask for his pack-up. Last year, Tim wound up with microwave curries most days (at a hefty cost of Â£6 for 2!) or a Bachelor’s Pasta N Sauce. But I decided to try to not only save us some money, but to also give him some healthier meals, as the only way his curry was Slimming World friendly was if I went to Iceland and bought the SW frozen curries, but more often I wound up popping down to the co-op at the last minute! Using the crock pot to make soup means I can make it in bulk to last the whole week. A few weeks ago, I made Parsnip and apple soup, last week was butternut squash soup, and this week is Tomato Speed soup. The best part about the tomato soup is it’s less than Â£3 for all the ingredients as this works great with the value ranges! And if you’re on an early shift, you can put this in the crock pot the night before! Dump everything into a 3L crock pot and turn on low for 8-10 hours. In the morning, use a stick blender or transfer into a blender to blend until smooth. You will need to weigh your apples before putting them in the crock pot to determine the total number of syns for this soup, then divide it by the number of portions. This should make at least 4 servings and each serving should be 1-2 syns. I did not peel the parsnips or apples as I relied on the stick blender to smooth everything, but you could take an extra step and peel them first. If the soup is too thick, add more vegetable stock to thin it out. Put all ingredients in a 6L crock pot and cook on low for 8-10 hours. In the morning, use a stick blender or transfer into a blender to blend until smooth. I did not peel the squash or potato as I relied on the stick blender to smooth everything, but you could take an extra step and peel them first. If the soup is too thick, add more vegetable stock to thin it out, but we liked it as a thick soup. I also added leftover mashed potatoes and leftover carrot and swede mash to it this time, and it gave it some extra flavour and helped to stretch the servings. This soup has no syns! Dump everything into a 6L crock pot and turn on low for 8-10 hours. In the morning, use a stick blender or transfer into a blender to blend until smooth. If the soup is too thick, add more vegetable stock to thin it out. Makes 8 400ml portions. This soup has no syns! When a new Slimming World recipe book comes out, I always flip through it with a set of tabs and tab off the recipes I’d like to try. One of the recipes I marked in Best Loved Extra Easy Recipes was Weetabix Cake (p156). 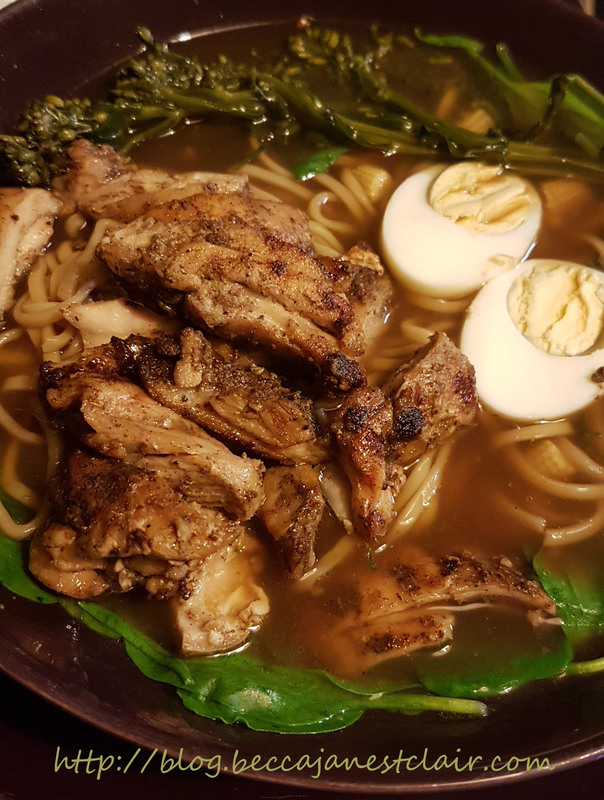 I finally decided to make it today, but unfortunately I didn’t have the Skim Milk or the mixed spice it calls for, so I needed to get a little creative. 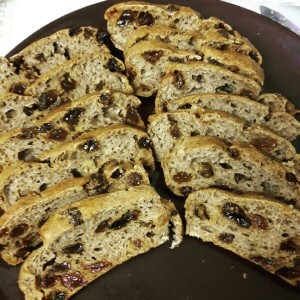 I thought about the recipe for my Lincolnshire Plum Bread and how you soak the sultanas in tea, so I decided to try it with the Weetabix Cake, and for the spices, I used the mixture I use for Plum Bread (which is actually Pumpkin Pie spice). So really, alternate names for this could be Weetabix Plum Bread or even Pumpkin Spice Weetabix Cake. 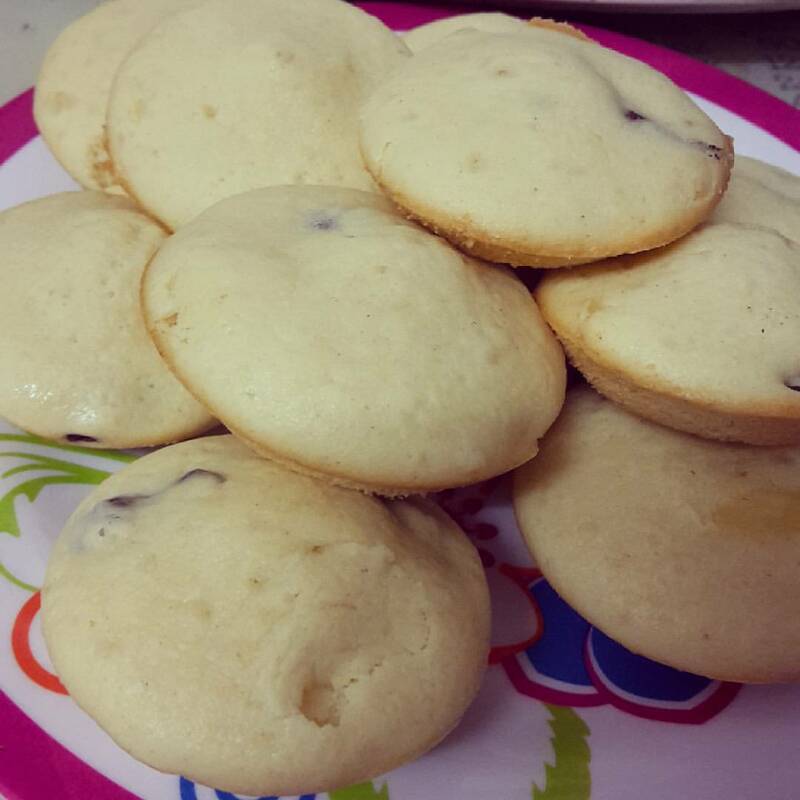 But I called it a tea cake on my Instagram pictures, so Tea Cake it is. This cake is not only suitable for someone following Slimming World, but it is suitable for a diabetic as well. 2. Place Weetabix and sultanas in a large bowl and pour over the tea. Leave to soak for 5 minutes. 3. Whisk two eggs in a separate bowl, set aside. 4. Add all dry ingredients to Weetabix and sultana mix and beat in the eggs. 7. Cut into 15 equal pieces. [Slimming World] Always double check your Syn Values! 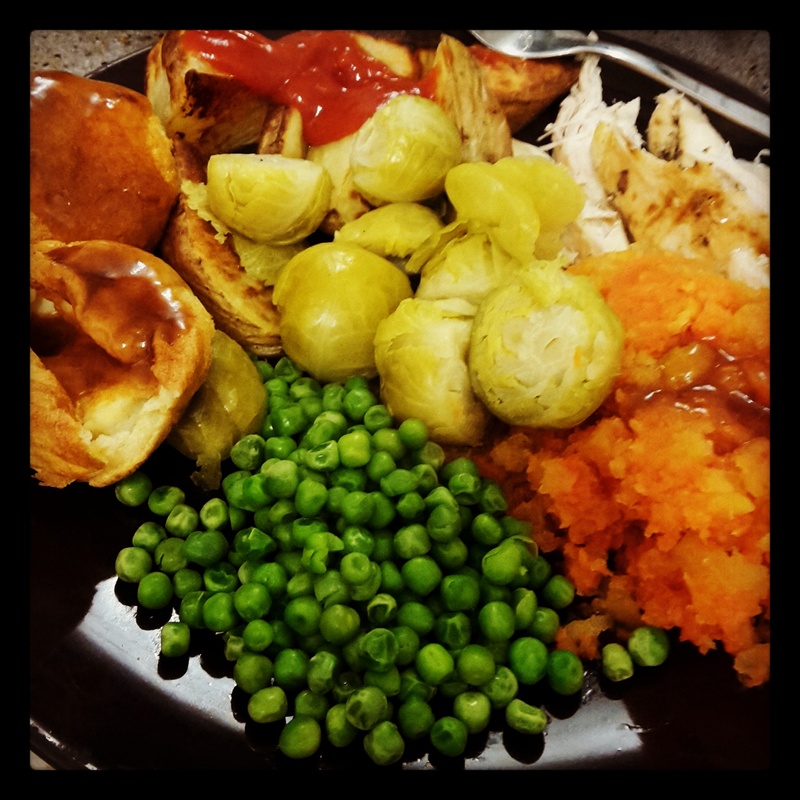 My slimming world mojo has been at an all-time low lately, and I took to Pinterest to look for some ideas and inspiration. Searching just “slimming world” gives you hundreds of results – links to recipes off the official website, charts showing syn values for snacks most often eaten, inspirational quotes, and recipes that other people have come up with. 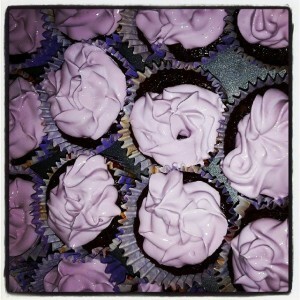 In fact, many of my own recipes I blog wind up on Pinterest, repinned by many. One thing I always leave in my disclaimer is that my Syn values are accurate at the time of posting, based on my exact ingredients and using the online Syn calculator, and I always encourage my readers to double check the syn values for themselves. While scrolling through the results on Pinterest, I came across a link to 5 under 5 Syns Chocolate Treats. Now, I’m not a huge chocolate eater, but I do like the occasional chocolate treat, so I decided to check out the suggestions/recipes on that page. 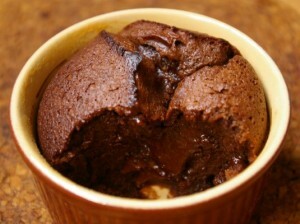 To my surprise, the last recipe was for a one syn chocolate cake in a mug. Hello, I always double check the syns when I find an online recipe (and encourage people who view my recipes to check for themselves, too) and I have a question for you……How is the chocolage mug cake only one syn? I can’t find raw cacao powder in the online syn database, but I found raw cacao nibs, which come in at 4.5 for 25g. I looked up nutritional information for The Raw Chocolate Co. Cacao Powder and ran it through the online Syn calculator, and it gives me 5.5 syns for 30g (2 TBS). You also would need to syn the apple, as it’s being cooked. 100g of an eating apple is 2.5 syns and 100g of a cooking apple is 1.5 syn. I just weighed a braeburn apple out of out a bag from Tesco, and it came in at 134g, so it would be slightly more than 2.5 syns (3.3 to be exact, I’d round it to 3.5, whicn nicely covers the dash of almond milk). Unsweetened almond milk is .5 syn for 100ml, although a dash is probably only around 50ml. So….. 5.5 + 3.5 = 9 Syns for your chocolate mug cup, not counting the chocolate yogurt on top. It’s a bit misleading to people to show this as only being 1 Syn. I am sincerely hoping this was just a mistake on her part or a miscalculation online. But it just highlights the importance of double checking the syn value for recipes that other people are blogging. Obviously, the recipes that are on the Slimming World website, Slimming World cookbooks, and the Slimming World magazine will be accurate….but take anything else posted with a grain of salt. Including my own recipes, because I make mistakes, too. 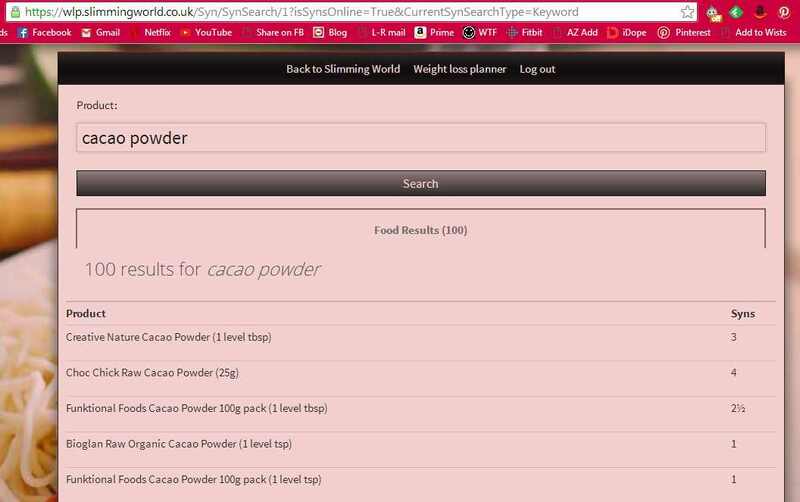 Since I’m still getting comments on this both on my blog and on the original post, I thought I would add in a screenshot of Cacao powder from the Slimming World online syns database. 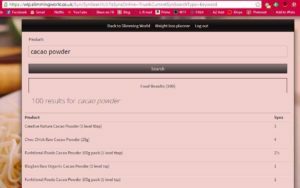 You can clearly see that the lowest syn values found for cacao powder is 2.5 syns per TBS if you buy that specific brand. Other brands are listed as 1 syn per teaspoon, and there are 3 teaspoons in the UK Tablespoon (4 in a US one). The recipe calls for 2 TABLESPOONS of Cacao powder, so you’re still looking at 5-6 Syns for the Cacao, plus syns for the cooked apple (again, 3.5 for your average apple based on weight). Even if we overlook the almond milk or the dash comes from your HEA allowance, we’re still looking at almost 10 syns for this “low syn” dessert option. I love Chinese food. But Chinese food isn’t very Slimming World friendly unless you make it yourself…and the biggest hurdle for me has always been making a tasty sauce. My husband and I like gooey Chinese food, and lots of the recipes I’ve found online just aren’t gooey enough. I have tried using orange Fanta, and while that was good, it still wasn’t satisfying. The other day I was looking at a recipe for orange chicken and suddenly it dawned on me to use orange squash (which is free on Slimming World). If you follow my exact recipe, this is a syn free meal that serves two comfortably, three if you bulk it out further. The nice thing about a stir fry is you can make it as big as you need it to be. Because all the ingredients are free on Slimming World, you also can play around with the taste of the sauce to get it to fit your specifications. 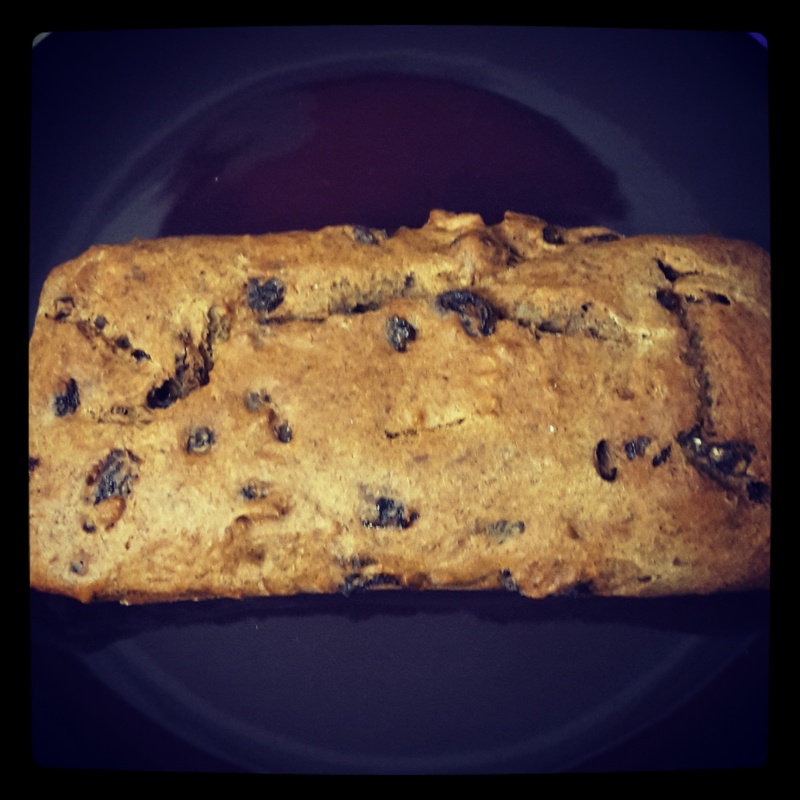 I’ve made this three times, and the first time I didn’t do any measuring other than the squash, the second time I did measurements so I could blog the recipe accurately, and the third time I did a combination of measuring and estimating. All three times it turned out quite tasty! 2. 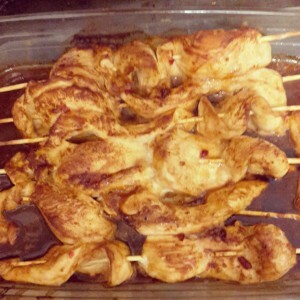 Toss diced chicken with Chinese five spice to coat, then stir-fry chicken for 5-10 minutes. 3. Add squash, soy sauce, puree, and vinegar. Give it a stir and let it come to a boil. 4. Add vegetables and stir-fry an addtional 5-10 minutes or until vegetables are to your liking. 5. Cook noodles or rice according to package instructions. 6. Give your sauce a quick taste test. Too sweet? Add a splash more vinegar. Too sour? Add the sweetener. Not enough orange flavor? add another splash of squash. Not spicy enough? Add more five spice. 7. 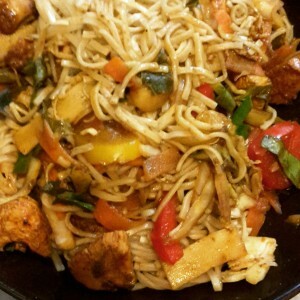 Divide noodles or rice between bowls and top with stir-fry. Garnish with fresh orange segments. Once again, on my phone. Usual disclaimers apply….double check your syns and I’m not affiliated with Slimming World. For some reason, Easter makes me homesick more than Christmas. 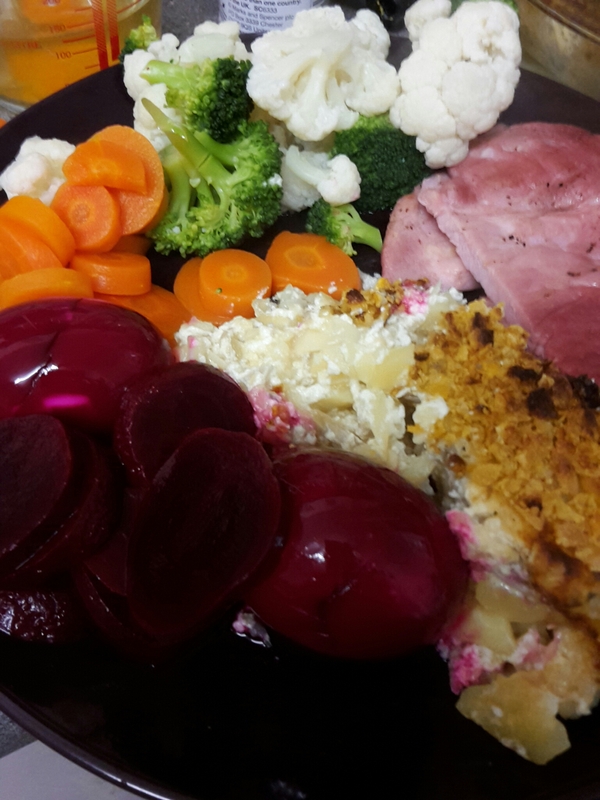 This year, I decided to replicate some of my family’s favourite Easter staples, and managed to make it fit in with Slimming World! The original calls for lots of cheddar cheese, butter, a creamy based soup, and butter. Sounds delicious, doesn’t it? I don’t even want to think about the syns. Here’s my version that comes in at 10.5 syns for the whole dish! 2. Drain and chop the potatoes (I used my chopper attachment on the stick blender). 3. Drain and chop mushrooms (ditto). 4. In a large bowl, combine potatoes, mushrooms, quark, fromage frais, and cheese. 5. Spray a casserole dish with frylight. 6. Spread potato mixture evenly in dish and top with crushed cornflakes. 7. Spray the top with butter flavoured fry light (if you have some, or use regular). 8. Bake 30-45 minutes or until bubbling. The second food I missed was red beet eggs. This one is really easy. 1. Hard boil and peel eggs. 2. Place eggs in a large bowl. 3. Pour beets and juice over eggs. 4. Top with vinegar until eggs and beets are covered. 5. Cover bowl and refrigerate. The more time you have, the better tasting the eggs! 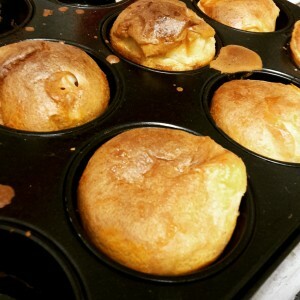 One thing my husband has missed with his Sunday dinners since I started on Slimming World has been Yorkshire Puddings. Especially after I got good at making them. Today, someone shared a one syn Yorkshire Pud recipe on one of the Slimming World Facebook groups and I decided to try it. The result was light and airy Yorkies with no guilt! – Pre-heat the oven to 200C. 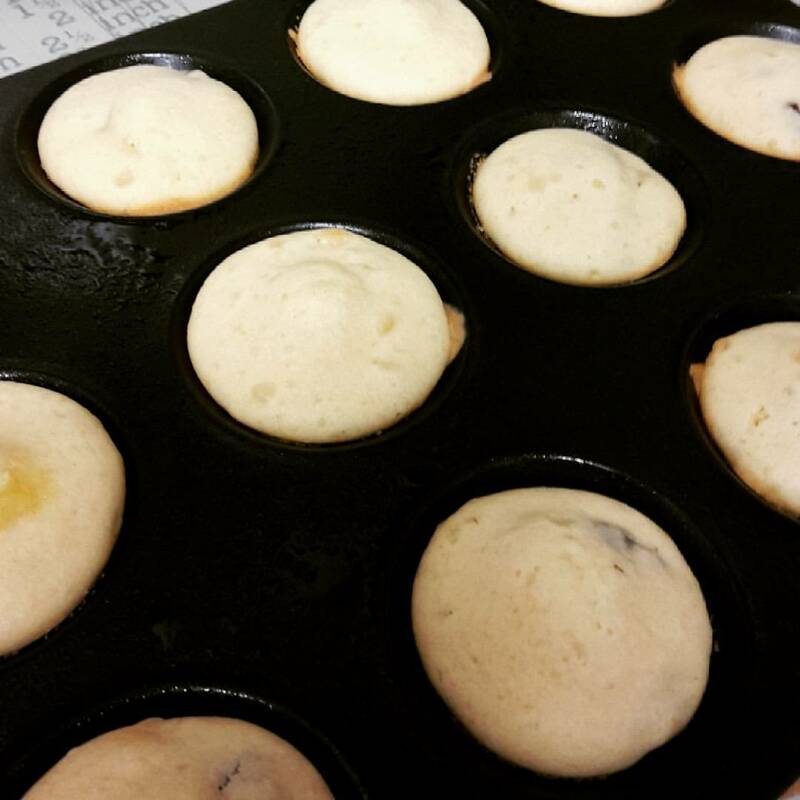 While the oven is pre-heating, put in a 12-cup yorkie tin (I used a cupcake tin) so it can get nice and hot. – Whisk (or use a hand blender) together all ingredients, until foamy. 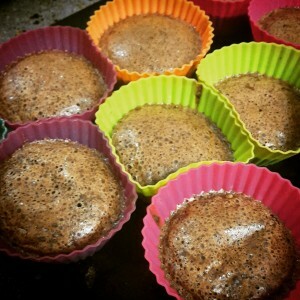 – Carefully remove tin from the oven and spray each cup with Frylight. – Evenly distribute mix between the cups. I found measuring spoons helped. – Bake for 18-20 minutes or until puffy and golden brown. 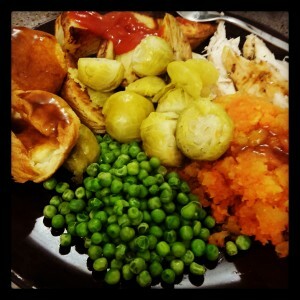 Serve with your favourite roast dinner for only one syn each! I really wanted cupcakes today. It’s a Sunday, so I either had to bake with what I had or what I could buy at the local co-op. I searched on the Slimming World website and found the recipe for the chocolate log….but I didn’t have the ingredients for the filling. I also prefer to reduce sugar where possible, so this is my cupcake recipe loosely based off the chocolate log. This should make 10 cupcakes for a total of 15 syns or 1.5 each. Posting this from my phone, so I don’t have my usual disclaimers. But please double check your syn values if you use different ingredients. Spoon dry mix into eggs and gently stir. Spray 10 silicone cupcake cases with frylight and evenly spoon in mix (about 3 dessert spoonfuls per case). Bake 10-12 minutes until edges come away from the case. 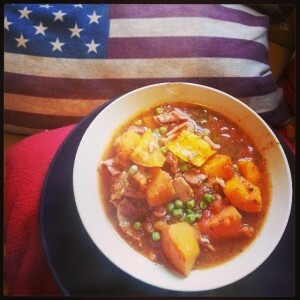 Last week I was on the Slimming World website, when I spotted a recipe for Squash, Potato, and Bacon stew. It looked like a great idea, but I wasn’t a fan of several of the ingredients. So, like I tend to — I changed up the recipe to fit my own likes/needs and what I had in the kitchen. It turned out more like a cross between a stew and a soup – a stoup, really. It was really good, but I think next time I might chop up the squash a little bit smaller so it’s easier to eat with a spoon. This recipe is Syn free on the Extra Easy (Orange) plan. You could omit the bacon to make it free on Green. If you follow Red, you will need to work out your Syn values. This recipe will take about an hour and half from prep to finish, though steps one and two can be prepared ahead of time and the squash and potato stored in the fridge for up to a day. 2 small squash, or 1 butternut squash. I took advantage of the season (and the fact that I love squash!) and picked up two random looking squashes – one orange (looked like a mini pumpkin) and one with yellow stripes. Both were about the size of a softball. 1 – Pre-heat the oven to 180C. 2 – First, you will need to roast your squash and potato. Cut your squash in half lengthways and scoop out all the seeds, then lay cut side up on a baking tray sprayed with frylight. Cut the sweet potato in half lengthways and add it to the tray cut side up. Spray the tops with Fry Light and roast for 45 minutes. If your squash was large, it might take longer. Poke your squash with a fork and if it feels tender, it’s done. Take it out of the oven and let it cool slightly. (optional: peel the skin off while it’s still hot if you don’t want or like the skin. I left mine on). Once you are able to handle the squash and potato, cut them into chunks (size is up to you). 3 – Chop up the bacon and spray the bottom of a deep stove-top safe casserole dish with fry light (I used my Le Cruset dutch oven for this, but a large saucepan will do). Add the bacon to the pan and lightly fry. You don’t need the bacon to go crispy (unless you like it that way!). 4 – Once the bacon is cooked, add the tinned tomato, vegetable broth, passata, and herbs and bring to a boil. Add in your chopped squash and sweet potato and simmer for about 20 minutes. 5 – Add the frozen peas and cook until the peas are done (about 10 minutes). I might try this in my crock pot sometime. If I do that, I won’t pre-roast the squash or potato, but I will still pre-fry the bacon. Firstly, please excuse any typos I don’t catch. I’m on our wireless keyboard, and it has problems with the letters h, j, and k.
For reasons unknown, today I really wanted my mom’s Tuna Noodle Casserole. 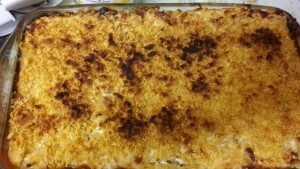 It was a staple of growing up and probably my second favourite tuna based casserole (the first one is Captain’s Casserole, a recipe I’m sure I’ll Slimming World-ize at some point). So I asked my mom to send it to me and I took a look at it. Butter, flour, and milk were going to shoot the Syn value pretty high, but then I remembered a recipe for a white sauce in the little book of sauces, so out it came for research purposes. Now, I didn’t ave any noodles, so I used whole grain pasta. You can use noodles or pasta, whatever you happen to have on hand. We also never measure out the noodles, just cooked a few handfuls! 1. cook pasta according to directions on package and pre-heat the oven to 175C. 2. While the pasta is cooking, make your sauce by gently heating the milk and cornflour, removing it from the heat just before it starts to boil, and whisking in the fromage frais, mustard powder, salt, and pepper. Add both tins of drained tuna to the sauce mixture. 3. 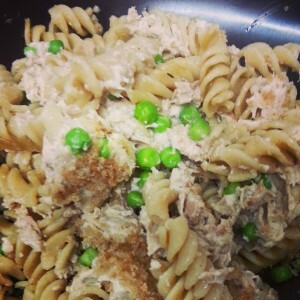 Spray a casserole dish with frylight and begin layering your casserole with a layer of pasta, some peas, then the tuna mixture. Repeat layers, making sure the tuna is the final layer. 4. You have two options with your bread. You can either cut it into cubes and put the cubes on top, or blitz it in a blender to top with breadcrumbs. 5. Give the layer of bread a squirt of frylight and bake for 25-30 minutes until thoroughly heated and the breadcrumbs/cubes are golden. Total Syns in this recipe: 6 Syns for the whole thing. It makes plenty for 2 or 3, and probably enough for 4 if you have lots of sides with it. This version wasn’t as saucy as what my mom would make, but you could always make more sauce (but remember to recalculate your Syns if you add extra milk or cornflour). A few years ago, Tim and I were planning on celebrating our birthdays (they’re only three days apart) at our favourite Italian American restaurant here in the UK. Due to Tim’s work schedule, we went out for Lunch instead of Dinner, and got the chance to order off the Lunch menu. Tim ordered something called “black and blue pasta”. He loved it and has been disappointed that it’s not a Dinner option at the restaurant. I kept saying I would try to re-create it at home, but I’m really picky about my blue cheeses and I worried it wouldn’t melt very well and it would be swimming in fat. A few weeks ago, we were talking at my local Slimming World group (Consultant Rebecca Stones!) about melting Laughing Cow wedges. Now, I had melted the regular ones to make a poor woman’s mac n cheese, but hadn’t tried it with the flavoured ones, so an experiment was conducted, and Tim tells me it tastes just as good (better!) than what we could get at Frankie and Benny’s! 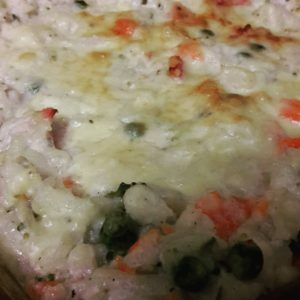 I’m posting this recipe because two of my friends saw my Instagram picture on Facebook and couldn’t believe this was “diet food”!! 1. Pre-heat a griddle pan (or frying pan) over high heat, sprayed with Frylight. While the pan is pre-heating, start cooking your pasta according to the package directions in a separate pot (I always pre-boil the water in the kettle to give it a head start to cut down on cooking time). 2. Toss the chicken with the spices and add to the griddle pan. Cook on high for about 5 minutes, then turn over and cook for an additional 5. continue to turn the bites of chicken until they are cooked through and browned (starting to char a little!). 3. Drain the pasta and add it back to the pot. Add the 4 blue cheese triangles and the fromage frais and mix over low heat and keep stirring until the cheese is melted and smooth. 4. Serve with a salad or vegetables of your choosing (I made a dressing with Fromage Frais and herbs). This is so good, I want to make it again tonight…..